Sometimes we take certain things for granted; our logo is one of these things. We see it in the newsletter every month, it is on our nametags and membership cards, it appears in our letterhead, and it is found on our club’s pin. Our official logo is the design created by Bob Dalager in 1988, the result of a club logo competition. Bob had lengthy discussions with his wife Kora who suggestedit be a single tree and not be too much "frou frou" nor "cutsie wootsy." The result was a hand-drawn winning design. 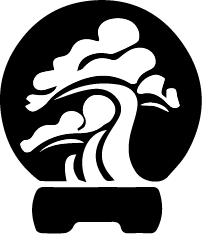 Fred Miyahara took the design and tweaked it into a more stylish bonsai and our current logo was born. Gary Gilmore, a jeweler in Ocean Beach made some silver and gold pins and pendants that were given to founding members of the club. Maude Laracy was one of the recipients of these pins. Currently, the club gives out three colored pins with the logo: Gold, given to all main demo speakers and past members of the board; Bronze, given to any member of SDBC upon their first tree shown in a major bonsai exhibit; and Black, the club’s pin you can purchase at the tool sales table. So next time you see our logo, remember it represents our club and feel proud to be part of it.